Members of the international hacker collective Anonymous have claimed they have identified the Ferguson, Missouri law enforcement officer involved in the fatal shooting of Michael Brown, an unarmed teenager killed on Saturday, which sparked days of protest and raised racial tensions. The hacktivist collective said Wednesday in a tweet that it was holding back the name of police officer until it confirmed the name of the police officer with a second source before releasing it publicly. "We have the name of the shooter," the Anonymous group member tweeted under the Twitter name Operation Ferguson. "We just can't verify. We need to either talk to witnesses or get a second leak source." Michael Brown, 18-year-old, was shot multiple times by a local police officer on Saturday, which happened around 1:40 p.m. Brown's body was then left on the sidewalk for hours. He was killed following an alleged altercation with the Ferguson police. Since then, the police have been accused of racism and become the focus of retribution by an angry public. However on Thursday morning, the hacktivist group announced that it has named the officer who killed Brown over the weekend, and have posted Facebook profile photograph purported to be of the man. "Do not release more info on this random citizen," the Police Department tweeted. "We only release suspect information after the investigation is complete and charges have been issued." The group claimed that the name of the police officer is B***n W***m**, but the St. Louis County Police department denied the claims and said that the group has identified the wrong guy and that officer is not an officer from Ferguson or St. Louis. “St. Louis County PD claims B***n W***m** doesn't work for them or #Ferguson PD. We'll see about that,” TheAnonMessage Twitter account tweeted early Thursday. On the other side, the Ferguson Police Department has declined releasing the name of the officer who actually shot Brown, citing safety concerns for the officer. This prompted Anonymous to vow in order to dismiss the police involved in the incident. 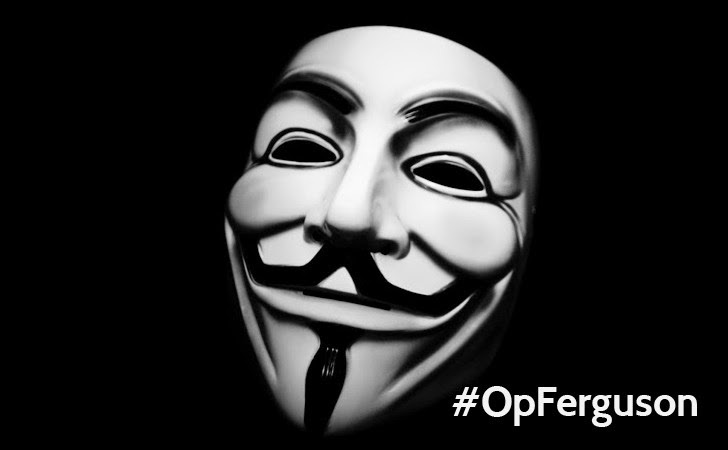 Since Anonymous hacktivists made the claim and unveiled the name of the officer, his name has been shared more than 3,000 times in the first hour. "The things that are happening in #Ferguson disgust me," one Twitter user wrote. "[Redacted] you will be killed soon enough #RIPMikeBrown." The Anonymous hacktivists have also added that it will release more details about the police officer in the coming hours if the St Louis County police department will not take an action against the shooter. The department is still investigating the matter. The group claims it has video of his body loaded into a police SUV. It have also released the officer's full address at 12pm local time and if there is no response from the police department, it will release a full cache of information on him at 2pm local time.